Work with Meaning, Work with Joy is an honest, insightful, and challenging guide to working with meaning in any job. A pioneer of the emerging spirituality and work movement, author Sullivan has spent years interviewing thought leaders, studying trends in organizational development, writing articles, and consulting with individuals and businesses. Here she brings together her vast hands-on experience and keen insights into a concise, helpful book that offers wisdom and inspiration as relevant to CEO’s as they are to mailroom clerks and mid-level managers. An ecumenical book that respects and draws from several religious traditions and spiritualities, Work with Meaning, Work with Joy revolutionizes traditional ways of conceiving of work and offers practical tools for finding your true vocation, bringing faith and integrity into the workplace, creating balance, and achieving worklife excellence. Filled with memorable stories and innovative ideas, Work with Meaning, Work with Joy also offers questions, resources, and ideas for further reading. Pat Sullivan asks you to engage in a deep inquiry that can lead to profound possibilities. She provides many tools that enable you to connect your work, whatever it is, with your spiritual life. If you’re unhappy at work, read this book! ~ Stewart Levine Author, The Book of Agreement and Getting to Resolution. 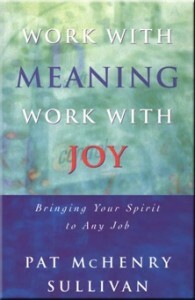 Work with Meaning, Work with Joy is available from any bookstore. Or, order an autographed copy plus a beautiful inspiring card for your workplace for only $20 (includes shipping in the United States) from Pat Sullivan, 4200 Park Blvd., #119, Oakland, CA 94602.